Our monthly social group, The T-Club, gathered in our Café last week for the premiere viewing of Dial House Cinema. It was a fantastic turn out with everyone enjoying the drinks and popcorn provided by the team working in Dial House Cafe while they waited for the movie to begin. 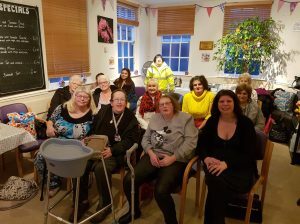 A showing of “The Greatest Showman” was thoroughly enjoyed by all on our television donated by Wavelength, a fantastic charity that works to offer comfort and companionship through technology. This initiative brings together Dial West Cheshire’s T-Club, Brightlife and WaveLength – which all have compatible aims to reduce social isolation. Meeting every third Tuesday of the month in Dial House Café, our monthly social group, The T-Club, is for those aged 50 and above, where the T stands for Tea, Tunes, Technology and most importantly, Togetherness. Activities are offered at a highly subsidised rate making it accessible to all. We are always looking for new members. You can see our upcoming activities and how to book your place, here.